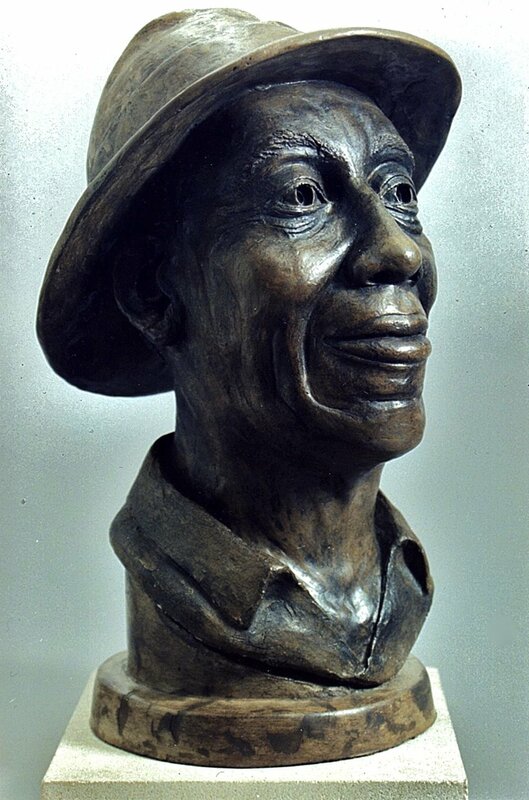 This is a bronze portrait sculpture of John Hurt, who was a blues musician with a distinctive guitar style who retired from music after a brief recording career in his 30's but, after a life of share-cropping, he was rediscovered in his 60's. He took to his newfound success with grace & humility. Tom Paxton told me that he always had a smile on his face, even in repose, that Tom attributed mostly to his religious faith, but also to an underlying bit of mischief. "Nearer My God to Thee" is a song that he often performed, but it also describes his state of being. Cast Aluminous Cement. For Bronze. 16 x 10 x 9 inches.